Club A boat trip aboard the Marlin del Rey Catamaran from Playas del Coco, Costa Rica. 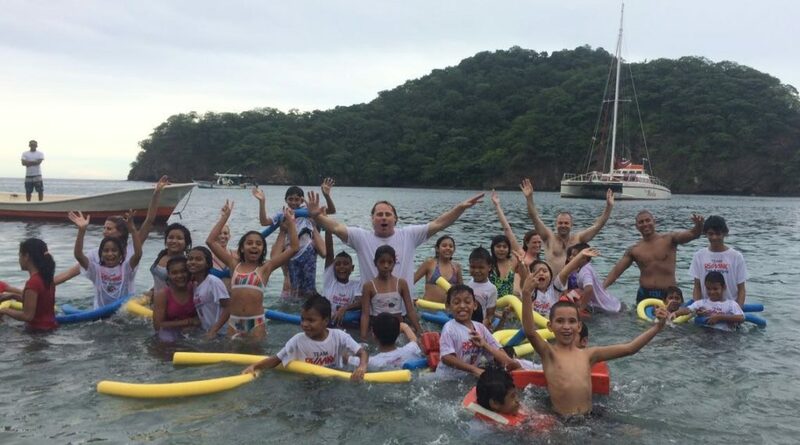 So we thought it would be great to invite 50 kids to come to the beach and go on a boat ride aboard the Marlin del Rey Catamaran. So we called our friend Bret and he gave us a great deal and we booked the whole boat for the day just for the kids and adult volunteers from Club A. We also got to know Bethany and some of the volunteers and heard some of the stories about the kids. These are definitely kids that need a helping hand and it is great to see Bethany and her fellow founders and volunteers do such thankless work. Here is an excerpt from Club A’s website to give you an idea of what they are about and why we think it is a worthwhile organization to be involved in. Club A is a non-profit organization that seeks to work with kids on a weekly basis to help them succeed in school. By helping kids improve their academic level and teaching them about being responsible citizens, we hope they will have bright futures and improve their economic situation. Club A started in June 2014 by five women who saw a need in a nearby impoverished community to help kids do well in school. The neighborhood does not have running water and is one of the poorest in Costa Rica. Believing strongly in the power of education to reduce poverty, Club A’s founders felt that it wasn’t enough to give the kids school supplies, uniforms, and shoes because they wondered, “Who will help the kids do their homework and study now that they have the required items to attend school?” After all, many of the kids’ parents cannot read and struggle to feed their large families. They decided to establish a weekly after-school club to specifically help kids with their basic math and language skills (reading and writing Spanish). They also wanted to teach the kids English, the language that all the best-paying jobs require in Costa Rica. Additionally, they have monthly life-skill themes, such as being honest, responsible, helpful, law-abiding citizens. Today, Club A has 80 kids, ages 5 to 13, enrolled in the program, all of whom must show proof of enrollment in school in order to sign up for Club A. In order to stay in the Club, the kids must have excellent behavior and attendance. Club A is completely run by volunteers and has no paid staff. Club A takes place every Tuesday afternoon at the neighborhood’s community center. There, 80 Club A kids between the ages of five and thirteen eat a snack before rotating through three or four volunteer-led stations on basic math, Spanish language skills, and English. Some of the volunteers are native English speakers who use games, songs, and other activities to help the kids learn quickly.